It took only five months from the initial idea in July 2000 until the construction of the first section started. Just eight months later, in August of 2001, the Miniatur Wunderland opened with its first three theme worlds. Here you can read how an idea, which at first appeared impossible to realize, turned into a major success. On August 16th, 2001 the Miniatur Wunderland had its grand opening with the sections Middle Germany, Knuffingen and Austria. By today we already have 9 complete sections. The last section to be opened was Italy on February 21st, 2018. In July 2000, Frederik Braun was visiting the alpine city of Zurich, Switzerland. Strolling through the alleys of Zurich’s center, he came across a railway model shop, which at once evoked childhood memories in him. Inspired by this reminiscence, the idea to make a long forgotten childhood dream come true became more and more prominent within hours after seeing the railway model shop. On the very same day, Frederik called his twin brother Gerrit, taking him by surprise by saying: “We are going to build the world’s largest model railway”. Gerrit, rather sceptic by nature, thought Frederik had gone mad and doubted the sincerity of his idea. But after receiving at least another six calls that day, with Frederik enthusiastically proposing new ideas on the topic, Gerrit realized how serious his brother was about the idea. He started considering the project from an economical and technical point of view. He came to the conclusion, that the project would be a technological challenge, the economic aspect would be very risky, from an entrepreneurial point of view it would be plain crazy, but overall it should be possible. Thus, Gerrit was infected by this idea as well. At that time, the two brothers, together with their business partner Stephan Hertz, had been running a night club in Hamburg and wanted out of the nightlife scene for a while. The following days and weeks Frederik, Gerrit and Stephan spent their time substantiating their mutual dream, in spite of all doubts and skepticism from people around them. Shortly after the “Zurich Epiphany”, all three of them felt that they would commit themselves to this risky adventure. Before their dream could come true, they had to secure one thing: This adventure should not destroy the existence that had been built up over the years as owners of a night club and music label. Therefore they had to make sure, that the dream could be financed, that enough visitors would come, that the technical side of things could be realized, and whether there was a location in Hamburg to accommodate the biggest model railway of the world. In order to find out whether enough visitors would come to cover the substantial capital outlay, the three of them decided to do a survey. More than 3,000 people with different characteristics were interviewed online and asked to decide which, mostly fictional, touristic places of interest they would want to see when visiting Hamburg. Male survey participants voted the idea of the “Miniatur Wunderland” to number 3, whereas with female voters it fell into last place. Despite this controversial outcome the founding team decided: “WE ARE GOING TO BUILD THE WORLD’S LARGEST MODEL RAILWAY”. Why Hamburg, why the historic warehouse district? In Wunderland's Speicherstadt, many tourists are sight-seeing, too. The "Wunderland within Wunderland", including a model railway in scale 1:900, is a special highlight. “To me, Hamburg is the most beautiful and perfect city in the world.” is a quote often heard from Frederik, Gerrit and Stephan, when asked about the city. All three of them are Hamburgians by heart and feel a close connection to their home city as well as responsibility. Therefore, from the beginning, it was clear to the team that the world’s largest model railway would of course be built in Hamburg. However, looking for a suitable location within the prospering city on the Elbe river proved to be complicated. The task was to find a location that is attractive to both tourists and locals and easily accessible. At least 2,000 m2 would be needed on each floor, as well as a possibility to expand in the future. And the architecture had to be suitable for a model railway! All at affordable prices, of course. The Hamburg Board of Economics made the introductions to the HHLA (Hamburger Hafen und Logistik AG), who was immediately enthusiastic about the idea and provided the premises at Kehrwieder at fair conditions. The perfect location was found. How was the Wunderland financed? A perfectly planned break in: the gangsters were almost successful but in the vault a special unit of the police force are already awaiting the unwanted visitors. It soon became clear that a model railway of this size and richness of details would be enormously expensive and a loan needed to be taken on to get started. Frederik made an appointment with their preferred bank, the Hamburger Sparkasse (Haspa), and presented two pages of paper roughly outlining their idea and the wish to secure a loan of 2 million Deutsche Mark. All three of them were sure that their bank adviser would laugh at them. 2 million, two pieces of paper and the dream of a model railway. Certainly, this would not look like a promising investment to a banker - or so they thought. Surprisingly, the Haspa agreed to the loan very quickly. Looking back, the original estimate of 2 million Deutsche Mark was a miscalculation: Until today, the amount has grown to 14 million	Euro. Fortunately, the number of estimated visitors was also miscalculated - over 1,400,664 people from all over the world have visited the Miniatur Wunderland since then. At this point, we might add that, other than most exhibitions of its size, the Miniatur Wunderland is not publicly subsidized. In the following time, literally hundreds of ideas for a concept were collected, to create a site which would offer a great experience to every member of a family. It shouldn’t be a site behind glass barriers, but a complete model theme world in which the trains would be only one of many highlights. “Our idea was to build a world that would inspire men, women and children to dream and to be amazed.” was how Gerrit Braun described the basic idea. With this concept and thousands of crazy little ideas, the team approached Gerhard Dauscher, a highly recognized German model maker and layout designer from Mühlhausen in Southern Germany. Gerhard was immediately infected with the dream and cancelled all other projects. 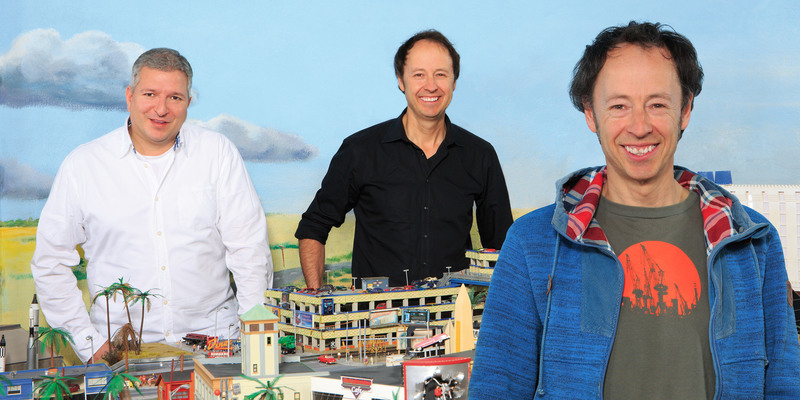 Since that day, he has been the head of the model making team at the Miniatur Wunderland and without a doubt his work is responsible for quite a piece of its success. To start construction a team had to be found. The four men decided to conduct a casting for model makers and more than 150 people applied. 40 of them were invited to a casting on two ensuing days. On the results of this casting, Gerhard Dauscher hand selected a team of model makers, of whom only one was a professional model maker, but all of them excellent craftsmen. 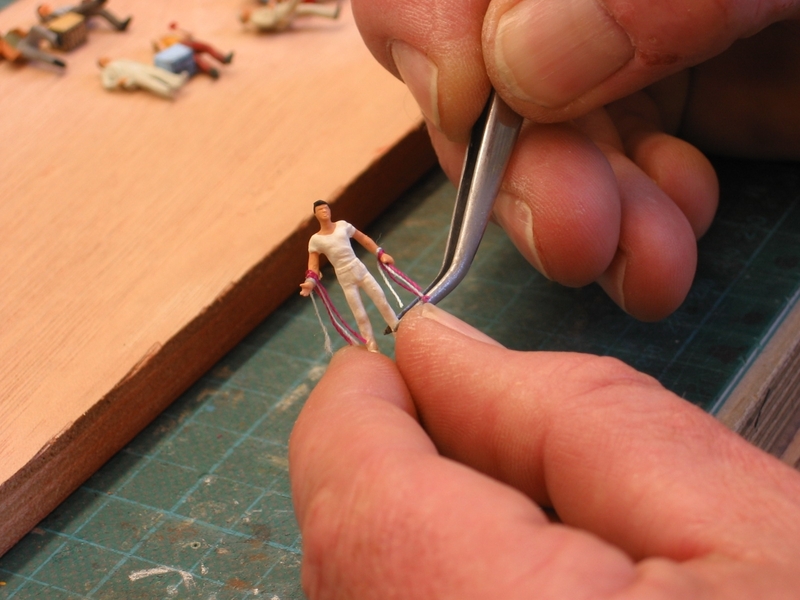 And this is how the construction of Miniatur Wunderland, which is still ongoing today, began. 1,500	m² grew into 7,000 m² of model layout and until 2028 we are planning even more! The first wonderlands are stuck! 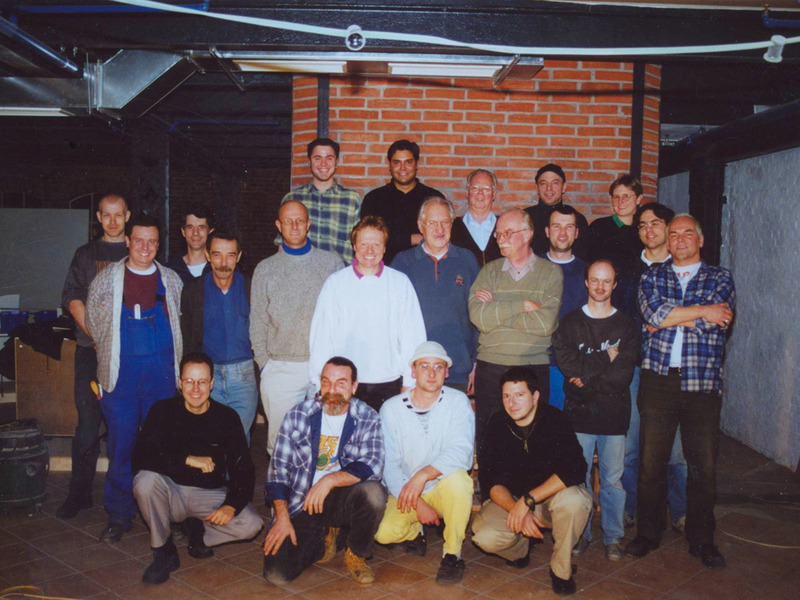 Here is a small part of the original team.